The extremely popular Infiniti textured steel roofing line offers innovative technology that delivers natural beauty, unmatched durability, and lasting all-weather protection. The color palette has expanded to a total of seven colors. 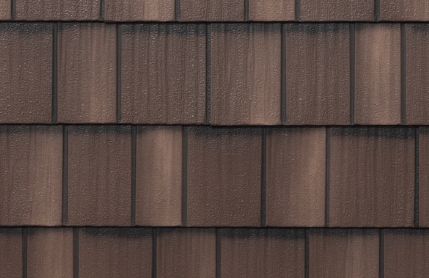 Infiniti’s natural grain and multi-tone shading has the contour, depth, and texture to create the look you want on your home. Its unique four-way interlock system withstands wind and rain of up to 160 mph. This is steel roofing that won’t chip, crack, fade, or peel – guaranteed. The materials at the heart of Infiniti pack the industry’s best protection from fire, rain, hail impact, and everything else that life can throw at it. Infiniti’s deep color palette is thermal-fused for permanent beauty and its sound-deadening coating mutes external sound. If your home deserves the highest level of performance and style, your home deserves Infiniti steel roofing!